Spikenard (Pang Poe) is one of the best herbs for Vata Dosha in the Ayurvedic medicinal system. It is used to control the nerves and a mind that is out of balance. It is excellent support for blood circulation, helping to regulate the heart. Spikenard or Pang Poe is a class of aromatic amber-colored essential oil derived from Nardostachys Jatamansi, a flowering plant of the Valerian family which grows throughout the Himalayas. The oil has been used over centuries as a perfume, a traditional medicine, or in religious ceremonies across a wide territory, time and peoples. This includes ancient India, classical Egyptians and The Romans. 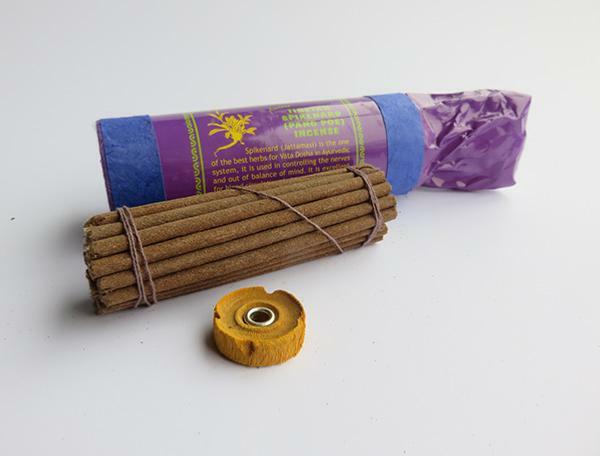 These sticks come wrapped in a handmade Lokta paper tube with a small wooden incense burner. Lokta paper is made from the fibrous inner bark of evergreen Daphne family shrubs. 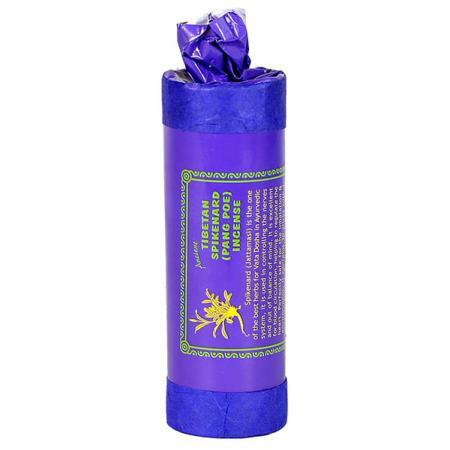 This artisan activity and the product is indigenous to Nepal, so is entirely appropriate and suitable for these Incense sticks. fits these Incense sticks. The full range of 12 fragrance from the Ancient brand we stock are Frankincense, Amber Resin, Mokchhya Nirvana, Nag Champa, Valerian (Sugandhawal), Gokul Resin (Bdellium), Juniper, Sandalwood, Agarwood, Spikenard (Pang Poe), Holy Basil (Tulsi) and Cedarwood. Tibetan Incense sticks are thicker than Japanese incense sticks - hence there is a special Tibetan Incense Stick Holder also available from Vectis Karma.